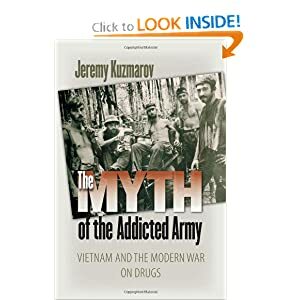 Jeremy Kuzmarov is an assistant professor of history at the University of Tulsa and author of The Myth of the Addicted Army: Vietnam and the Modern War on Drugs. It might not be Reefer Madness redux, but the blame being put on drugs for civilian deaths in Afghanistan today has that same air of hysteria about it. The New York Times, in a front-page headline on September 28, proclaimed, “Drug Use Cited in the Killings of Three Civilians.” The story by William Yardley details the case of Cpl. Jeremy Morlock, twenty-two, an infantryman with the 1st Infantry Regiment, 5th Stryker Brigade Combat Team who, in leaked video testimony, described the murder of Afghan civilians in three separate incidents to investigators and testified that soldiers in his unit collected dismembered body parts, including fingers and a skull, and took photographs posing with the dead as part of a macabre competition. Front and center in the piece is the allegation that drugs are responsible for the atrocities. Yardley cites court testimony revealing that Morlock was using prescription medication at the time of the incident and highlights that other members of his units were regularly taking drugs like hashish, insinuating that this use is linked to the atrocities. With the exposure of a fresh round of atrocities in another distant war, powerful Americans are again looking for scapegoats. And the media is providing it for them. Rather than chemical intoxicants, Morlock’s actions can in reality be linked to a similar atrocity-producing environment which existed in Vietnam. Though the political contexts are different, American soldiers have again adopted racial stereotypes towards their enemy (now called hajis instead of gooks), are again under pressure for high body counts, and are frustrated by the unpopularity of the occupation and corruption of American allies, all of which was has fueled support for the insurgency. Morlock’s conduct and that of his platoon-mates can be additionally attributed to the breakdown of social norms in war and an accompanying loss of human empathy overlooked by the Times. Lifton quoted a Vietnam veteran in his book: “A very sad thing happened while we were there—to everyone. It happened gradually…with each death and every casualty until there were so many deaths and so many wounded, we started to treat death and loss of limbs with callousness, and it happens because the human mind can’t hold that much suffering and survive.” A similar reaction is being experienced by soldiers today in other parts of Asia. The media is also ignoring the fact that the practice of taking of body parts as trophies has numerous precedents in American history. In Policing America’s Empire: The United States, the Philippines and the Rise of the Surveillance State, historian Alfred W. McCoy provides evidence that American army officers responsible for training Filipino constabulary units adopted morbid games in which they collected rebel body parts, including jaws and ears, as a sign of their success. John W. Dower has shown in War Without Mercy how American soldiers captured Japanese body parts during World War II as part of a vicious race war and sent human skulls and necklaces of enemy teeth to their girlfriends as presents. The same pattern repeated itself in Vietnam and Laos as was revealed in testimony by antiwar GIs at the Winter Soldier hearings in Detroit and is on record in army criminal investigation reports at the National Archives. According to historian Richard Drinnon, author of Facing West: The Metaphysics of Indian-Hating and EmpireBuilding, the practice of collecting body parts originated during the Indian wars and is a product of a “savage” war doctrine in which the alleged barbarism of America’s enemies is used to rationalize equal if not greater levels of barbarism by conquering armies. The collection of human flesh as trophies further provided a symbol of mastery and dominance over subjugated populations and allowed for the realization of hyper-masculine fantasies cultivated in soldiers’ youths. Drinnon’s analysis resonates greatly with Morlock’s actions which have deep socio-cultural, institutional and historical roots. For political elites and media outlets such as the New York Times who have championed the war in Afghanistan and the global expansion of American military power, acknowledging these roots would require a painful self-examination and shift in ideological principles that they are unwilling to undertake. Accordingly they search for scapegoats and play up the tenuous link with drugs, contributing to a preservation of the legitimacy of the war effort and to the continued demonization of drugs in American society. In a 1972 article “Scapegoating Military Addicts” published in Transaction Magazine, psychiatrist Thomas Szasz wrote: “Like the Germans after World War I who claimed that their troops were stabbed in the back by pacifists and other ‘unpatriotic elements’ at home, we claim that our troops are being stabbed in the back by heroin and the pushers responsible for supplying it to them. As we de-escalate against the Vietcong, we will escalate against heroin. No doubt we shall find it easier to control Americans who shoot heroin than Vietnamese who shoot Americans.” A similar epitaph it appears can be written in a few years about the war in Af-Pak if the wild allegations continue. Surely it had been right "control switch" in theory, but in practice we have not found it a bit easier.